Engine support tool – No.KM-6210-A. Flywheel locking tool – No.KM-6433-1. High-pressure fuel pump gear puller 1 x 2 – No.KM-161-3. High-pressure fuel pump gear puller 2 – No.KM-161-B. High-pressure fuel pump sprocket holding tool – No.KM-6245. DO NOT use special tools listed above to lock engine when slackening sprocket bolts. Mark position of crankshaft position (CKP) sensor before removal. Do NOT turn crankshaft via camshaft or other sprockets. 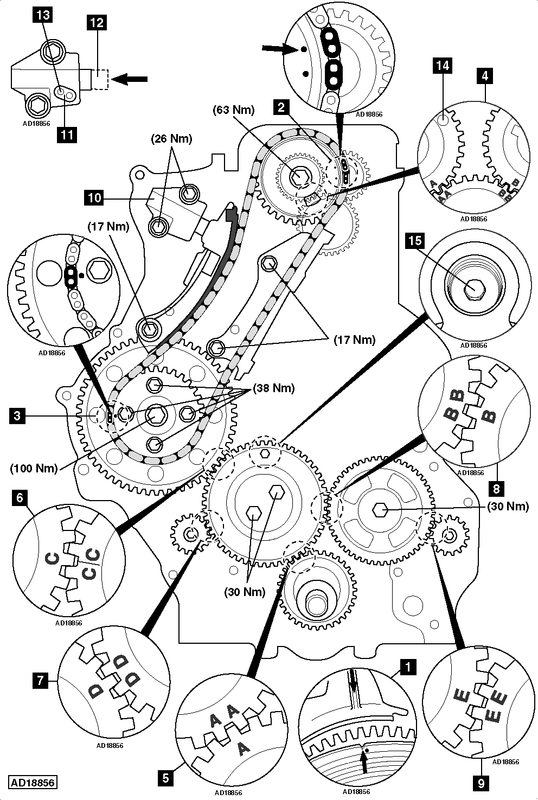 Do NOT turn crankshaft or camshaft with timing chain removed. Engine at TDC on No.1 cylinder  . Ensure timing marks on camshaft sprocket aligned with blue coloured links  . Ensure timing mark on high-pressure fuel pump sprocket aligned with yellow coloured link  . Ensure timing marks on camshaft gears aligned with timing marks on auxiliary gear 1  . Align timing marks on crankshaft gear and auxiliary gear 2  . Align timing marks on auxiliary gear 2 and high-pressure fuel pump gear  . Align timing marks on auxiliary gear 2 and balancer shaft gear 1  . Align timing marks on auxiliary gear 2 and auxiliary gear 3  . Align timing marks on auxiliary gear 3 and balancer shaft gear 2  . Remove tensioner assembly before carrying out engine repairs  . Turn ratchet clockwise to release tensioner  . Push plunger into tensioner body in direction of arrow  . Insert suitable pin to lock tensioner plunger  . Fit camshaft sprocket and timing chain. Ensure camshaft sprocket aligns with exhaust camshaft gear locating pin  . Install tensioner after repairs  . Tighten camshaft sprocket bolt. Tightening torque: 63 Nm. NOTE: Remove blanking plug from timing cover. Before removing high-pressure fuel pump gear lock auxiliary gear 2 with suitable bolt  .